We first encountered Bible Code study in the 1990's and have since followed it's developments. We view these wonderful findings not so much as magical or a way to predict the future but rather as the signature of God which has been inserted into His revealed word to man in very unique ways. While the very early work in this field of study was done by Jewish Hebrew scholars, and certainly the advent of the computer made these analyses possible, there are now noted Christian theologians who are finding very specific bible code references, in the Old Testament, which are not just the signature of God - rather - unmistakably the signature of Jesus Christ and the Trinity. The root is ﬣ וּ ﬣ meaning "to exist" e.g. "is" while the Yood יִ provides the "He"
This principle of Judah (praise), as the pathway to YHWH, is supported in scripture. It was the tribe of Judah which camped directly to the east of the entrance to the tabernacle during the forty years the people of Israel spent in the desert. When the camp of the people of Israel set out, during the forty years in the desert, following the cloud of God by day or the column of fire by night - it was the tribe of Judah which led the way. God chose the men of the tribe of Judah to lead the way into the promised land. The image is that praise goes first and then God acts; note Isaiah chapter 60, verse 18: "Violence shall no longer be heard in your land neither wasting nor destruction within your boarders ... you shall call your walls Salvation and your gates Praise." Note Jesus speaking in the Gospel of John, chapter 10, verses 9-10: "... I am the door, if anyone enters by Me, he will be saved and will go in and out and find pasture ... I have come that they may have life, and ... have it more abundantly." 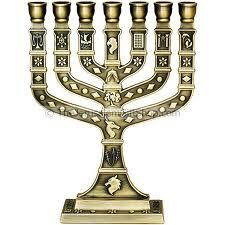 Jewish history and culture provide two separate types of menorah. There is a nine candle menorah which is used at the time of Hanukkah and a seven candle menorah the design of which was provided by God to Moses for use in the Tabernacle. In the transliteration of Genesis chapter 1, verse 1, we see the Tabernacle Menorah which consists of a base and shaft with six branches, beaten out of solid gold. The six branches curve to the same height as the central shaft so that all seven lamps, at their apex, are in a straight line. God revealed the design for the menorah to Moses in the Old Testament book of Exodus chapter 25, verses 31-40: � � make a lampstand of pure gold ... hammered gold � with six branches running from its sides, three branches of the lampstand from one side and three branches of the lampstand from its other side � make seven lamps for it which will always be lit ..."
This is God, addressing us regarding his Word - that is the revealed word of God which has been given to us - that is the bible. Here we look at the Hebrew text segment referring to God's word "are life to those who find them, and healing to all their flesh" - we feel that this is another statement which matches God's design of the Menorah which He instructed Moses to build. As before we are looking at 7 Hebrew words and the central word is of particular interest. Note here in this string of Hebrew words, from Proverbs chapter 4, the image of the menorah as we saw in Genesis chapter 1, verse 1. There are 7 words and the central word has seven letters with Alef as the central letter. The alef ﬡ is Jesus, note that moving right to left we fine Ha ﬣ which is God the Father and Mem ם which is the Holy Spirit. 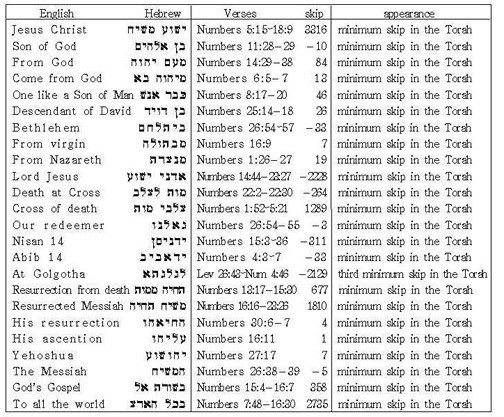 Our intent in this study is to get to examples and an analysis of Yeshua (Jesus Christ) in Old Testament scripture as identified by techniques which are generally termed "bible code" and also by both graphic word images as we see in the two "menorah" verses above and also by numerology. Classical Hebrew Numerology has, in recent years, picked up a bad name among Christian because it is also found now in various occult practices and is also used for fortune telling. While those are not spiritually acceptable activities, it does not mean that much Classical Hebrew Numerology is a sincere search for a more in depth knowledge of God and His will for our lives. We'll deal with that when we get there - here in this section (C) we thought we'd review some of the wonderful findings Jewish investigators have made using "bible code" techniques on the scriptures of the Old Testament. C.1. The Hebrew word Torah ( תוּרﬣ) is found, by bible code techniques, beginning in Genesis chapter 1, verse 1. Finding the first TAV ( ת ) then counting off 49 sequential Hebrew Letters you find that the next letter is a VAV ( וּ ) /// you then count off another 49 sequential Hebrew Letters and you find that the next Hebrew letter is a RAYSH ( ר ) /// then count another 49 sequential Hebrew Letters and the next Hebrew Letter is a HA ( ﬣ ). This is a wonderful finding in itself, however investigators have found the same pattern for the Hebrew word Torah beginning in the first chapter of Exodus and also for the Old Testament Book Numbers. In Genesis, Exodus and Numbers the ELS sequence is right-to-left with the flow of the text. In the Old Testament Book Deuteronomy the same ELS sequence also exists however in this book the ELS sequence is left-to-right beginning in the fifth verse of the book. The sequence of 49 Hebrew Letters is significant in our search for the signature of Jesus Christ in the Old Testament because the 49th year is the Year of Jubilee. The Year of Jubilee is related to the Lord�s Sabbath. We work six days and rest on the seventh because that is the Sabbath of the Lord. The Hebrew people observed the Shmita which is a cycle of seven years and the Year of Jubilee is a cycle of seven Shmitas � every 49 years, though some students of Jewish history feel it was the following year � that is every 50 years though no one is sure. We�ll take 49 years as it�s consistent with God�s pattern for both the Sabbath and the Shmita. Jubilee יובל then is the year at the end of seven cycles of shmita - that is seven cycles of Sabbatical years - 7 years each.- which we accept as the 49th year. �8 You shall count off seven weeks of years, seven times seven years, so that the period of seven weeks of years gives forty-nine years. 9 Then you shall have the trumpet sounded loud; on the tenth day of the seventh month�on the day of atonement�you shall have the trumpet sounded throughout all your land. 10 And you shall hallow the fiftieth year and you shall proclaim liberty throughout the land to all its inhabitants. It shall be a jubilee for you: you shall return, every one of you, to your property and every one of you to your family. 11 That fiftieth year shall be a jubilee for you: you shall not sow, or reap the aftergrowth, or harvest the unpruned vines. 12 For it is a jubilee; it shall be holy to you: you shall eat only what the field itself produces. 18 You shall observe my statutes and faithfully keep my ordinances, so that you may live on the land securely. 19 The land will yield its fruit, and you will eat your fill and live on it securely. 20 Should you ask, �What shall we eat in the seventh year, if we may not sow or gather in our crop?� 21 I will order my blessing for you in the sixth year, so that it will yield a crop for three years. 22 When you sow in the eighth year, you will be eating from the old crop; until the ninth year, when its produce comes in, you shall eat the old. 23 The land shall not be sold in perpetuity, for the land is mine; with me you are but aliens and tenants. 24 Throughout the land that you hold, you shall provide for the redemption of the land. 25 If anyone of your kin falls into difficulty and sells a piece of property, then the next of kin shall come and redeem what the relative has sold. 26 If the person has no one to redeem it, but then prospers and finds sufficient means to do so, 27 the years since its sale shall be computed and the difference shall be refunded to the person to whom it was sold, and the property shall be returned. 28 But if there are not sufficient means to recover it, what was sold shall remain with the purchaser until the year of jubilee; in the jubilee it shall be released, and the property shall be returned. 29 If anyone sells a dwelling house in a walled city, it may be redeemed until a year has elapsed since its sale; the right of redemption shall be one year. 30 If it is not redeemed before a full year has elapsed, a house that is in a walled city shall pass in perpetuity to the purchaser, throughout the generations; it shall not be released in the jubilee. 31 But houses in villages that have no walls around them shall be classed as open country; they may be redeemed, and they shall be released in the jubilee. 32 As for the cities of the Levites, the Levites shall forever have the right of redemption of the houses in the cities belonging to them. 33 Such property as may be redeemed from the Levites�houses sold in a city belonging to them�shall be released in the jubilee; because the houses in the cities of the Levites are their possession among the people of Israel. 34 But the open land around their cities may not be sold; for that is their possession for all time. 47 If resident aliens among you prosper, and if any of your kin fall into difficulty with one of them and sell themselves to an alien, or to a branch of the alien�s family, 48 after they have sold themselves they shall have the right of redemption; one of their brothers may redeem them, 49 or their uncle or their uncle�s son may redeem them, or anyone of their family who is of their own flesh may redeem them; or if they prosper they may redeem themselves. 50 They shall compute with the purchaser the total from the year when they sold themselves to the alien until the jubilee year; the price of the sale shall be applied to the number of years: the time they were with the owner shall be rated as the time of a hired laborer. 51 If many years remain, they shall pay for their redemption in proportion to the purchase price; 52 and if few years remain until the jubilee year, they shall compute thus: according to the years involved they shall make payment for their redemption. 53 As a laborer hired by the year they shall be under the alien�s authority, who shall not, however, rule with harshness over them in your sight. 54 And if they have not been redeemed in any of these ways, they and their children with them shall go free in the jubilee year. 55 For to me the people of Israel are servants; they are my servants whom I brought out from the land of Egypt: I am the Lord your God. Isaiah, chapter 61, verses 1-3: "The spirit of the Lord God is upon me, because the Lord has anointed me; he has sent me to bring good news to the oppressed, to bind up the brokenhearted, to proclaim liberty to the captives, and release to the prisoners; 2 to proclaim the year of the Lord�s favor, and the day of vengeance of our God; to comfort all who mourn; 3 to provide for those who mourn in Zion� to give them a garland instead of ashes, the oil of gladness instead of mourning, the mantle of praise instead of a faint spirit. They will be called oaks of righteousness, the planting of the Lord, to display his glory. The Christian age, in which we now live is the Year of Jubilee. To many folks the Hebrew word Torah is the name for the first five books of the Old Testament - those five books written by Moses through the inspired grace of God. For Jewish folks, the meaning is this plus they interpret the meaning of this Hebrew word as "teaching" - that is the direct teaching of God to them as His chosen people. We agree and find many references within the written Word of God to support this. The Hebrew word Torah ( תוּרﬣ) actually comes from the Hebrew root word Yarah ( וּרﬣ ) which means to "throw" or "point the way (direct)" or "shoot an arrow". Reviewing the root word is helpful for a better understanding of Torah when we also look at the Hebrew word for sin - Chata ( חטﬡ ). Chata has the literal meaning: "to miss the target". C. 2. Another bible code finding that seems interesting is found in the Old Testament Book Genesis, chapter 2. This chapter provides the description of the Garden of Eden. Equidistant Letter Sequencing (ELS) analysis within this scripture passage finds the Hebrew name for twenty-five different trees encoded within the text. The statistical probability for this as a random occurring anomaly is 100,000 to 1. C.3. In the Old Testament Book Genesis, chapter 38, we find the story of Jacob's son Judah and the two children he had through his widowed daughter-in-law, Tamar. Tamar gave birth to two sons who were fathered by Judah, their names were Zerah and Pharez. Jesus Christ is descended from King David and King David was descended from Pharez. Essentially, Pharez is the ancestor of Boaz, of the Book of Ruth, who was the father of Obed. Obed was the father of Jesse and Jesse was the father of King David. 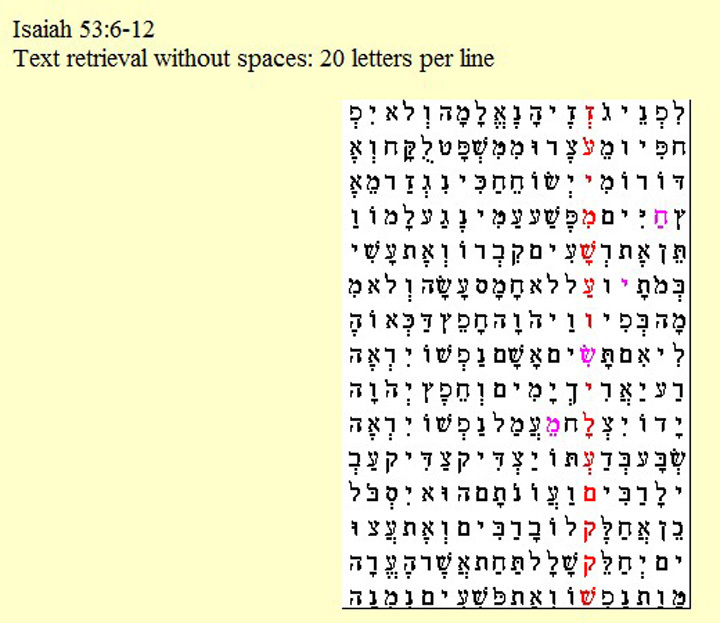 This is of interest in bible code studies because, within Genesis chapter 38, ELS analysis finds encoded at fourty-nine letter sequences (note 49 again) the names: Boaz, Ruth, Obed, Jesse (Yishai) and David in the chronological order of their appearance in the Old Testament. The statistical probability for this as a random occurring anomaly is 800,000 to 1. C.3. In the Old Testament Book Genesis, chapter 28, we find the account of Jacob's Ladder - this is the vision he had on Mount Moriah of a ladder to heaven. Mount Moriah is the temple mount in Jerusalem where the original temple of Solomon stood, the rebuilt temple following the Babylonian capativity and King Herod's renovation of that structure which is the Jewish temple referenced during the time of Jesus in the four Gospels of the New Testament. Within the scripture passage, of Genesis chapter 28, where Jacob says: "this is none other than the house of God and this is the gate of heaven" - ELS analysis identifies two Hebrew words: temple and Torah. The statistical probability for this as a random occurring anomaly is 17,000,000,000 (that's billion) to 1. 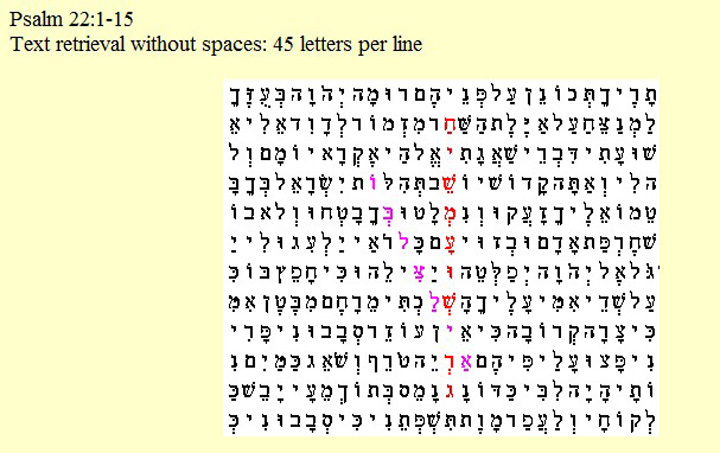 There are countless findings from bible code analyses which are both wonderful and amazing. Our intent here is not to review them all or try to provide "proofs" as in the end they are just wonderful if you have faith and if not they are usually dismissed on some arbitrary basis. In the time frame of the first and second Gulf wars, bible code ELS analysis was applied to both current and historical names, again very interesting findings which document the signature of God within His written revealed Word - however it is not our focus in this study. 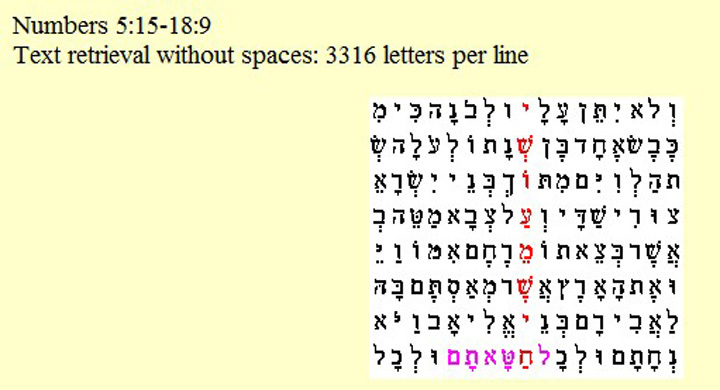 In the next section, we'll develop bible code ELS findings for the name of Jesus Christ within the Old Testament. We will be using Jesus' Hebrew name Yeshua for this study - obviously the ELS findings are not by Jewish Hebrew scholars but rather they are fairly recent studies by Christian folks, a few were Jewish Hebrew scholars who became Messianic Jews (Christian). We find in this study that many of the ELS Yeshua scriptures are also Alef-Taf scriptures, an unexpected finding though again both wonderful and interesting - as we develop those passages, we will note our findings related to Alef-Taf. Before Jesus was born, God made very sure that His name would be Jesus. This is God�s revealed name in our new covenant which Jesus brought to us. Jesus in Hebrew is Yeshua. This name Yeshua is a combination of two Hebrew words: YA (an abbreviation for YHVH) and SHUWAH which means salvation. Yeshua means "YHVH is my Salvation," or "YHVH has become my Salvation." D.1. Note the text from the Old Testament Book Isaiah, Chapter 53, verses 4-10: "
"... he has borne our infirmities and carried our diseases; yet we accounted him stricken,struck down by God, and afflicted. 5 But he was wounded for our transgressions, crushed for our iniquities; upon him was the punishment that made us whole, and by his bruises we are healed. 6 All we like sheep have gone astray; we have all turned to our own way, and the Lord has laid on him the iniquity of us all. 7 He was oppressed, and he was afflicted, yet he did not open his mouth; like a lamb that is led to the slaughter, and like a sheep that before its shearers is silent, so he did not open his mouth. 8 By a perversion of justice he was taken away. Who could have imagined his future? For he was cut off from the land of the living, stricken for the transgression of my people. 9 They made his grave with the wicked and his tomb[c] with the rich, although he had done no violence, and there was no deceit in his mouth. 10 Yet it was the will of the Lord to crush him with pain.When you make his life an offering for sin, he shall see his offspring, and shall prolong his days; through him the will of the Lord shall prosper. In Isaiah 53, verse 10 we find that bible code ELS analysis identifies the two Hebrew words Shemi Yeshua - that is - "Yeshua is my name". This is also a passage of interest because verse 6 contains an Alef-Tav.
" Surely he has borne our infirmities and carried our diseases; yet we accounted him stricken, struck down by God, and afflicted. 5 But he was wounded for our transgressions, crushed for our iniquities; upon him was the punishment that made us whole, and by his bruises we are healed. 6 All we like sheep have gone astray; we have all turned to our own way, and the Lord has laid on him the iniquity of us all. 7 He was oppressed, and he was afflicted, yet he did not open his mouth; like a lamb that is led to the slaughter, and like a sheep that before its shearers is silent, so he did not open his mouth. 8 By a perversion of justice he was taken away. Who could have imagined his future? For he was cut off from the land of the living, stricken for the transgression of my people. 9 They made his grave with the wicked and his tomb[c] with the rich, although he had done no violence, and there was no deceit in his mouth. 10 Yet it was the will of the Lord to crush him with pain. When you make his life an offering for sin, he shall see his offspring, and shall prolong his days; through him the will of the Lord shall prosper. 11 Out of his anguish he shall see light; he shall find satisfaction through his knowledge. The righteous one,[h] my servant, shall make many righteous, and he shall bear their iniquities. 12 Therefore I will allot him a portion with the great, and he shall divide the spoil with the strong; because he poured out himself to death, and was numbered with the transgressors; yet he bore the sin of many, and made intercession for the transgressors." Now lets look at Isaiah 53 in Hebrew - this is modern Hebrew so there are vowels however the main letter text is still a mosaic of the 22 Hebrew Letters which we find in all Hebrew bibles today as well as the 3,000 year old Dead Sea Scroll version which is in the Hebrew museum in Jerusalem. In Psalm 22 we fine the Christian Bible Code �Jesus Messiah�. This ELS starts in Psalm22, verse 12 at the 24th letter and runs back to verse 1, letter 14. Daniel chapter 9, verse 26 ... "And after threescore and two weeks shall Messiah be cut off, but not for himself: and the people of the prince that shall come shall destroy the city and the sanctuary; and the end thereof shall be with a flood, and unto the end of the war desolations are determined." (Daniel 9:26). In this very well known revelation of Jesus Christ we find the name Yeshua - is encoded within Daniel 9:26 starting with the letter yod in the phrase "the city," and then counting left to right every 26th letter. There is also an Alef-Taf in verse 13. 1 In the first year of Darius son of Ahasuerus, by birth a Mede, who became king over the realm of the Chaldeans� 2 in the first year of his reign, I, Daniel, perceived in the books the number of years that, according to the word of the Lord to the prophet Jeremiah, must be fulfilled for the devastation of Jerusalem, namely, seventy years. 3 Then I turned to the Lord God, to seek an answer by prayer and supplication with fasting and sackcloth and ashes. 4 I prayed to the Lord my God and made confession, saying, "Ah, Lord, great and awesome God, keeping covenant and steadfast love with those who love you and keep your commandments, 5 we have sinned and done wrong, acted wickedly and rebelled, turning aside from your commandments and ordinances. 6 We have not listened to your servants the prophets, who spoke in your name to our kings, our princes, and our ancestors, and to all the people of the land. 7 "Righteousness is on your side, O Lord, but open shame, as at this day, falls on us, the people of Judah, the inhabitants of Jerusalem, and all Israel, those who are near and those who are far away, in all the lands to which you have driven them, because of the treachery that they have committed against you. 8 Open shame, O Lord, falls on us, our kings, our officials, and our ancestors, because we have sinned against you. 9 To the Lord our God belong mercy and forgiveness, for we have rebelled against him, 10 and have not obeyed the voice of the Lord our God by following his laws, which he set before us by his servants the prophets. 11 "All Israel has transgressed your law and turned aside, refusing to obey your voice. So the curse and the oath written in the law of Moses, the servant of God, have been poured out upon us, because we have sinned against you. 12 He has confirmed his words, which he spoke against us and against our rulers, by bringing upon us a calamity so great that what has been done against Jerusalem has never before been done under the whole heaven. 13 Just as it is written in the law of Moses, all this calamity has come upon us. We did not entreat the favor of the Lord our God, turning from our iniquities and reflecting on his fidelity. 14 So the Lord kept watch over this calamity until he brought it upon us. Indeed, the Lord our God is right in all that he has done; for we have disobeyed his voice. 15 "And now, O Lord our God, who brought your people out of the land of Egypt with a mighty hand and made your name renowned even to this day�we have sinned, we have done wickedly. 16 O Lord, in view of all your righteous acts, let your anger and wrath, we pray, turn away from your city Jerusalem, your holy mountain; because of our sins and the iniquities of our ancestors, Jerusalem and your people have become a disgrace among all our neighbors. 17 Now therefore, O our God, listen to the prayer of your servant and to his supplication, and for your own sake, Lord, let your face shine upon your desolated sanctuary. 18 Incline your ear, O my God, and hear. Open your eyes and look at our desolation and the city that bears your name. We do not present our supplication before you on the ground of our righteousness, but on the ground of your great mercies. 19 O Lord, hear; O Lord, forgive; O Lord, listen and act and do not delay! For your own sake, O my God, because your city and your people bear your name!" 20 While I was speaking, and was praying and confessing my sin and the sin of my people Israel, and presenting my supplication before the Lord my God on behalf of the holy mountain of my God� 21 while I was speaking in prayer, the man Gabriel, whom I had seen before in a vision, came to me in swift flight at the time of the evening sacrifice. 22 He came and said to me, "Daniel, I have now come out to give you wisdom and understanding. 23 At the beginning of your supplications a word went out, and I have come to declare it, for you are greatly beloved. So consider the word and understand the vision: 24 "Seventy weeks are decreed for your people and your holy city: to finish the transgression, to put an end to sin, and to atone for iniquity, to bring in everlasting righteousness, to seal both vision and prophet, and to anoint a most holy place. 25 Know therefore and understand: from the time that the word went out to restore and rebuild Jerusalem until the time of an anointed prince, there shall be seven weeks; and for sixty-two weeks it shall be built again with streets and moat, but in a troubled time. 26 After the sixty-two weeks, an anointed one shall be cut off and shall have nothing, and the troops of the prince who is to come shall destroy the city and the sanctuary. Its end shall come with a flood, and to the end there shall be war. Desolations are decreed. 27 He shall make a strong covenant with many for one week, and for half of the week he shall make sacrifice and offering cease; and in their place shall be an abomination that desolates, until the decreed end is poured out upon the desolator." 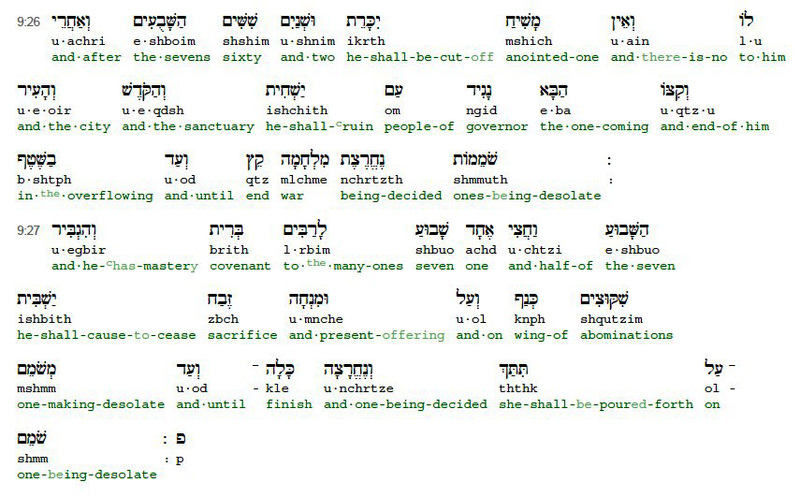 The name Yeshua ( ) is encoded within Daniel 9:26 starting with the letter yod in the phrase "the city," and then counting left to right every 26th letter. Note: we are both fond of and have found the teaching of Joseph Prince, Grant R. Jeffrey and Yacov Rambsel helpful in this Hebrew study.